Founded in 1993, the Carolina Renaissance Festival is one of the largest Ren Faires in the country, averaging some 200,000 annual visitors. The entire festival is held in the town of Huntersville, North Carolina, near Charlotte. 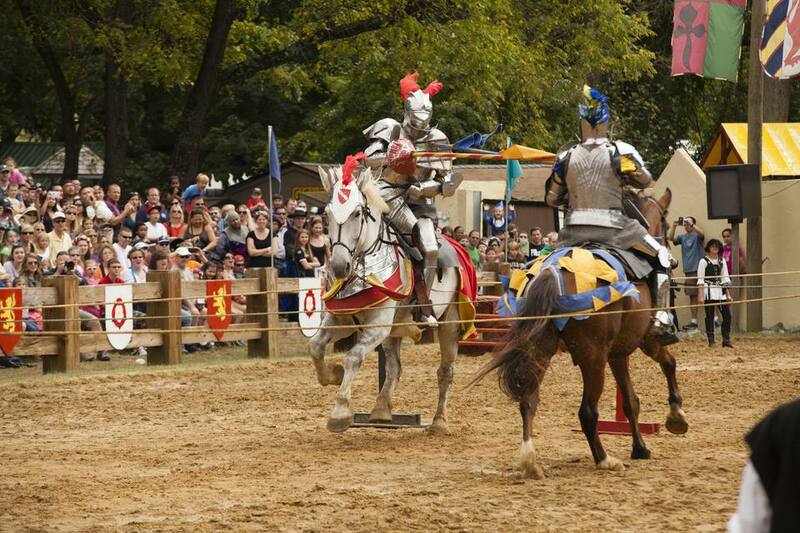 The fictional village of Fairhaven provides the setting for the Carolina Renaissance Festival, which features 1,000 artists and performers, arts and crafts, handmade jewelry, glass-blowing demonstrations, and of course, food from the medieval area. It wouldn't really be a ren fest without some giant turkey legs or fish and chips. In addition to watching daily jousts, visitors can try their hand at archery, crossbow shooting, ax throwing, and other period games and events. The 2018 festival will be held Saturdays and Sundays, Sept. 29 through Nov. 18. Admission for the 2018 Carolina Renaissance Festival varies depending on when, where, and how you purchase your tickets. Advance discount tickets are available online or at Harris Teeter stores, priced at $24 for adults, $14 for kids ages 5 to 12. Tickets purchased at the gate are $25 for adults, $15. Children under 5 are always free. For seniors over 60 and active or retired military personnel and spouses, tickets online or at Harris Teeter are $22; for children of military personnel, tickets are $12. Visitors can purchase season passes online or at the main gate ticket office, until 5 p.m. on Sept. 26. After Sept. 26, season passes are only available at the ticket office. An adult season pass is $140, a child season pass is $80. There are conditions on the passes; no refunds are given for closures due to weather or other unexpected conditions. The admission price includes parking, all entertainment shows, including the Tournament Jousting and Birds of Prey show. It does not include the purchase of arts and craft items, food or beverages, or rides and games. You can also buy a season pass that's valid for any festival day. Save $23 on opening weekend admission by receiving two adult tickets for just $23 at the Festival box office with a coupon. The festival will open on three special weekdays to accommodate students and teachers who wish to enjoy a very distinctive field trip opportunity. The student days program was created to highlight the educational aspects of the festival and to give school groups a chance to join the fun. The 2018 student days are available on the Renaissance Festival website. A special student day admission of $10 is made available to students. All entertainment, jousting, birds of prey presentations, and craft demonstration programs are included with admission. One teacher or chaperone is admitted free for every eight student tickets purchased. Bus drivers will be admitted free (with valid driver's license). Additional adults (beyond the 1 per 8 requirement) are also just $10. Coupons and weekend festival tickets are not accepted on student days. On student days, the festival gates open at 9 a.m. and will close at 2:30 p.m.